Over time, many new materials for interior design appear. Despite this, plastering of walls and ceilings remains the most popular way of finishing. The advantage of this method of decoration is undoubtedly the minimum thickness and durability of the coating. Plaster is a kind of finishing works, in which a solution of a mixture of cement, gypsum or clay components is applied to the wall, occasionally to ceilings. Plastering is mainly used for protection and aligning of the wall. It covers the walls, leveling and creating a thermal insulation of the room, and also increases their strength. Recently, the technology of finishing the external surfaces, called the wet facade, is gaining popularity.Provides for gluing the foam to the surface and further processing with a layer of decorative plaster, fulfills the finished facade function, insulates the walls and has an interesting appearance. By the type and form there is dry and wet monolithic, textured or relief, made with a stencil, with bas-relief images, individual modeling, plastering walls under wallpaper, and so on. Its various textures allow you to create any style in the room. Its various textures allow you to create any style in the room. 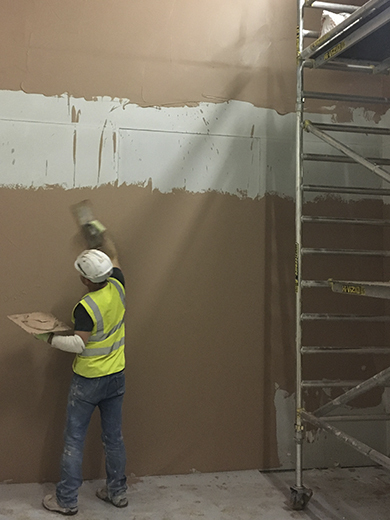 Dry plastering includes finishing with the help of ready plasterboard, which is used exclusively for facing walls inside the premises. High-quality work is carried out in a short time due to the material performance characteristics and its dimensions. It is possible to erect partitions and multi-level surfaces this way. The construction of plasterboard fastenings and profiles makes partitions installation without walls is possible. The layer resistant to atmospheric and mechanical influences is formed by plastering application which aligns and gives the walls a certain texture or color. Minimum of occupied space, versatility and durability of this wall treatment method are its doubtless advantages. The drawbacks include heavier construction, increased deadlines due to the drying of each layer, as well as the cost. For example, colored plasters contain acrylic binder, colorant and quartz sand. Color mixture can be used for door and window openings manual finishing, as well as internal surfaces of walls and ceilings. The stone mixture is used for finishing the foundations, and facing the facades for the rock materials imitation - terrazitic mixture. Relief coating with a pattern or drawing is obtained processing by sgraffito plastering. The marble flour and a binding element on a calcareous or acrylic base is the part of the polished plaster. Due to the long and time-consuming application process it visually creates an amazing depth and glow by reflecting light. There is a huge number of plastering forms and types which helps to carry any complexity repairs and implement a variety of design solutions. The choice of the plastering method and composition depends on the interior space and the desired effect as a result of its application.